MUMBAI: At least 18 people died yesterday when a building collapsed in India’s financial capital Mumbai following heavy rains that have wreaked havoc in many parts of South Asia. 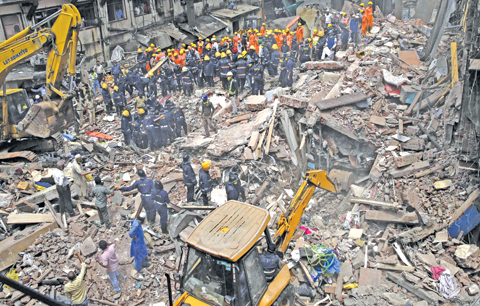 A dozen others were pulled from the rubble of the four-storey residential building, which gave way around 8:40 am in the densely populated area of Bhendi Bazaar. It was the most recent deadly housing collapse to strike the teeming metropolis-shining a spotlight on poor construction standards in the Asian country-and came after flooding in the city killed 10 people. “Eighteen people have died. Another 12 have been admitted to hospital,” Vijay Khabale-Patil, a spokesman for Mumbai’s civic authority, said. Officials estimated that up to 40 people could have been caught up in the disaster. Khabale-Patil said rescue operations would go on into the evening. Ambulances rushed the injured to the nearby J.J. Hospital in the south of the city while locals joined a 43-member National Disaster Response Force team in picking through piles of debris in a desperate hunt for survivors. Building collapses are common in Mumbai, especially during the monsoon season from late June to September, when heavy rains lash the western Indian city, weakening poorly built structures. Severe downpours caused flooding and chaos across Mumbai and the neighboring region of Thane on Tuesday although waters had receded by late Wednesday. Bhendi Bazaar, a scruffy colonial-era market, is one of Mumbai’s most historic districts and officials said the collapsed building was 117 years old.It had been marked for demolition as part of a $600 million redevelopment project that is replacing hundreds of ramshackle, decades-old low-rise buildings with around a dozen glitzy new tower blocks. Distraught residents said they rushed to the scene of the collapsed structure after hearing a loud crash. “There was a huge noise and we all came running,” Naseem Mogradia, who lives two lanes away, said. Shahid Khan, 52, said he didn’t know whether his friend and seven family members who lived on the ground floor were alive or dead. “I am just trying to help with rescue operations,” he said. Mumbai has been hit by several deadly building collapses in recent years, often caused by shoddy construction, poor quality materials or ageing buildings. Millions are forced to live in cramped, ramshackle properties because of spiraling real estate prices and a lack of housing for the poor. Activists say housing societies, private owners and builders often cut corners to save on costs. Rent control acts mean landlords cannot afford to maintain buildings while poor people choose to remain in homes even after they have been declared unsafe because they have nowhere else to go. “Most of the buildings in Bhendi Bazaar are old and dilapidated. We always live in fear that they will collapse during monsoons,” 63-year-old Mohammed Shaikh said.